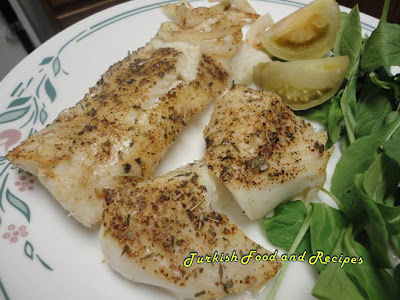 Rinse Cod fillets under cold water and dry with paper towels. Sprinkle with salt, the herbs and seasoning. Rub the fillets with your hands. Finally pour lemon juice all over and place over the greased Pyrex. Bake in a preheated 350F (180C) oven for about 30-40 minutes or until they get flaky and cooked. Serve hot with arugula and onion. Soguk su altinda Morina filetolari yikayin ve kagit havlu ile kurulayin. Elinizle ovarak tuz ve diger baharatlari guzelce yedirin. Sonunda limon suyu ile de ovalayin ve yaglanmis olan borcam tepsiye yerlestirin. Onceden isitilmis 180C (350F) firinda yaklasik 30-40 dakika ya da uzerleri hafifce kizarana dek pisirin. Yaninda sogan ve roka ile sicak servis yapin.